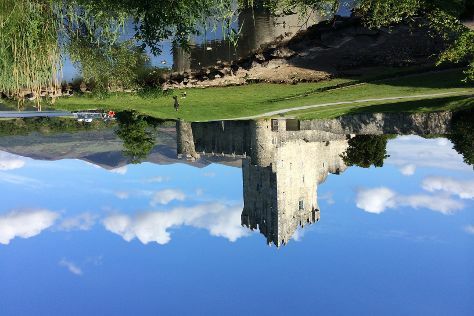 Start off your visit on the 18th (Sat): explore the historical opulence of Kilkenny Castle and then steep yourself in history at Jerpoint Park. Phoenix, USA to Kilkenny is an approximately 20-hour flight. The time zone changes from Mountain Standard Time to Greenwich Mean Time, which is usually a 7 hour difference. When traveling from Phoenix in November, plan for colder days and slightly colder nights in Kilkenny: temperatures range from 50°F by day to 42°F at night. You'll set off for Killarney on the 19th (Sun). Your day-by-day itinerary now includes Courtney's Bar. Start off your visit on the 19th (Sun): admire the striking features of St. Mary's Cathedral, then explore the historical opulence of Ross Castle, then get a taste of the local shopping with Peter Cox Photography, and finally join in the after-dark buzz at Courtney's Bar. On the next day, look for gifts at Aran Sweater Market, take in nature's colorful creations at Muckross House, Gardens & Traditional Farms, then look for gifts at Lorge Chocolatier, then stop by Kenmare Soap Shop, and finally look for gifts at Skyline Gallery. You can drive from Kilkenny to Killarney in 3 hours. Other options are to take a bus; or take a train. Expect a daytime high around 53°F in November, and nighttime lows around 44°F. Wrap up your sightseeing on the 21st (Tue) to allow time to drive to Galway. Your day-by-day itinerary now includes Charlie Byrne's Bookshop as well as Cliffs of Moher. Start off your visit on the 21st (Tue): enjoy the sand and surf at Fanore Beach, then explore the striking landscape at Cliffs of Moher, then look for gifts at The Burren Smokehouse,, and finally look for gifts at Charlie Byrne's Bookshop. Get ready for a full day of sightseeing on the 22nd (Wed): stop by Standun Spiddal, look for gifts at Hazel Mountain Chocolates, then admire the natural beauty at Coole Park, and finally appreciate the extensive heritage of Riverside Walk. You can drive from Killarney to Galway in 2.5 hours. Another option is to take a bus. In November, daytime highs in Galway are 52°F, while nighttime lows are 42°F. Finish up your sightseeing early on the 23rd (Thu) so you can go by car to Dublin. You've now added Guinness Storehouse to your itinerary. Kick off your visit on the 23rd (Thu): contemplate the long history of Kilmainham Gaol, sample the tasty concoctions at Guinness Storehouse, and then take a stroll through Temple Bar. Here are some ideas for day two: step into the grandiose world of Dublin Castle, then wander the streets of Grafton Street, and then delve into the distant past at Bru na Boinne. Drive from Galway to Dublin in 2.5 hours. Alternatively, you can take a train; or take a bus. In November, plan for daily highs up to 50°F, and evening lows to 38°F. You'll set off for home on the 25th (Sat).